Hill Top is a working farm formerly owned by Beatrix Potter, the famous author of children's books such as The Tale of Peter Rabbit and The Story of Miss Moppet. 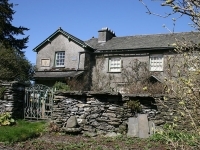 The cottage, along with Miss Potter's original furnishings and artworks, has been well preserved, and the quaint garden is still kept as she had made it, with a random selection of flowers, herbs, fruit and vegetables. The 2006 film Miss Potter is a wonderful introduction to the life and work of the author, and features stunning scenes of Hill Top and the surrounding countryside. Fans of this interesting author and her quaint English world will relish a visit to the farm.